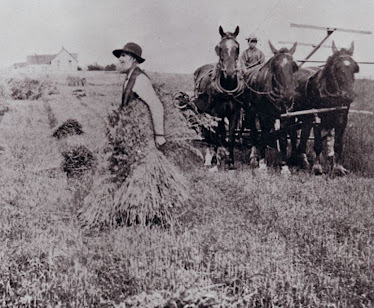 The venerable John Johnston, of Geneva, who is now eighty-four years old, and who says he thinks the average of all his wheat crops would be not less than twenty-eight bushels per acre, while he has raised, many times, over thirty-five bushels, and occasionally forty-two bushels, thinks it indispensable to success in wheat-growing to plough under clover. 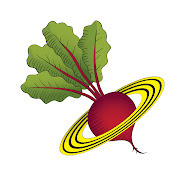 It may seem at first an absurd project to attempt to improve land by ploughing into it what has just grown out of it. If the clover drew all its nourishment from the land alone, this would be true. The clover, however, has the property f drawing large quantities of nitrogen from the air which are stored for the use of the grain crop following, which can absorb nitrogen only by its roots. 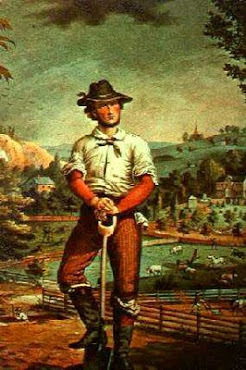 Clover, then, is to be regarded as the cheapest known source of nitrogen and organic matter, carbon, &c., but it cannot restore to exhausted land either potash or phosphates; and if our land is deficient in these essentials, we must add them to the clover before we can expect a good yield of grain. In New York this has not yet proved necessary, as the clover alone, with such manure as could be easily obtained, has been able to maintain the fertility of the land, under judicious rotation, for scores of years. Experience may prove that we may need in addition to use some potash and phosphate. Now, the potash can be had cheaply in the German potash slabs, and super phosphate can be prepared of good quality so as to be sold at $25 per ton, if it were not mixed with any nitrogenous manure. It is the nitrogen that cots, and which can be cheaply supplied by the farmer himself by ploughing under clover. The manufacturer of so-called super phosphate generally mixes some nitrogenous compound with the super phosphate at a cost which the farmer can ill afford to pay, even if he gets an honestly-mixed article—the purpose of the manufacturer being to get a manure which will produce a visible and immediate effect upon foilage when applied to farm crops. The farmer can buy his nitrogen, by ploughing in clover, at a price with which no trader can ever possibly compete, with the additional advantage of loosening the soil by the decomposing vegetable matter. The clover should be ploughed under when in full blossom. If the land will produce two crops, the first may be cut for hay, and the second ploughed under for manure. Why don’t you sow more clover? 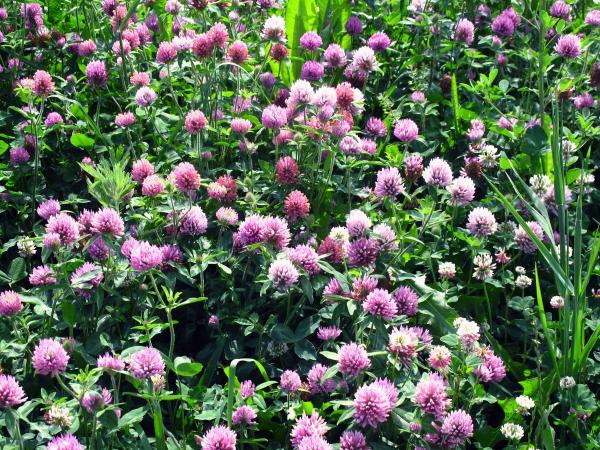 Both science and practice dictate the more frequent use of clover as a green crop to be ploughed in for the use of subsequent crops. It is not a very expensive mode of fertilizing land. So let us try it, and do it thoroughly. Use plaster freely to induce a heavy growth, and then resist the temptation to cut and cure the crop for hay, plough it in when in full bloom, and follow it with some grain crop, watching the result. 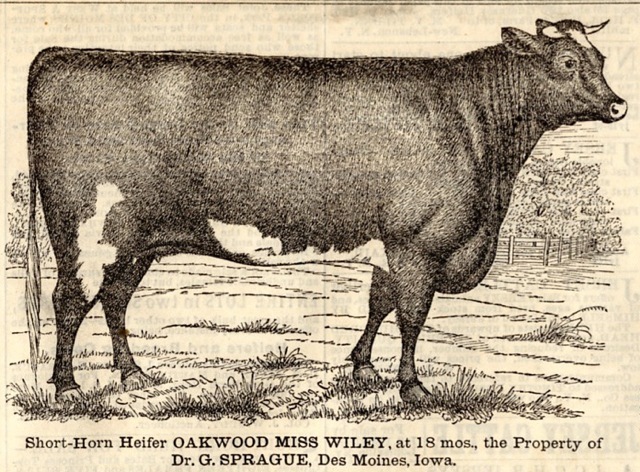 This picture comes from the August 19, 1875 Cultivator & Country Gentleman magazine. I own several years of this magazine and would like to someday make a collection of notecards with with the old cow illustrations. Fashions change in farming and stock-raising almost as much as they do in millinery, though perhaps,not quite so often. We are always aiming after something that is new, something that everybody else hasn’t got. 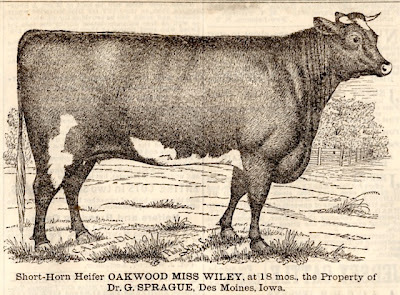 Every farmer will remember that a few years ago, the Jerseys were regarded as the “fashionable” breed, and their merits were claimed to be greater than could be found in any other class of cattle, especially for the butter dairy. The enthusiasm for them led to frequent and extensive importations, and it must be admitted that they have exercised a great and important influence on the common or native stock of New England, which they have, no doubt, greatly improved. More recently the Guernseys have rather taken the lead, and many claim for them the very first place at the head of the dairy breeds, upon our farms, as being better adapted for general purposes than even the Jerseys. The Channel Islands of Guernsey and Jersey are only about twenty miles apart, but the cattle of the two islands have been kept quite distinct for very many years, no animal of the bovine species having been allowed to land alive on the island of Jersey for nearly a century, while the Guernsey farmers have been equally jealous of all contamination of their neat stock for centuries. The result is that they are reaping a rich harvest of profit for their long and jealous care, just what the islands of nantucket and Martha’s Vineyard might do here by taking the same care. The Guernseys are somewhat larger than the Jerseys, and the butter made from their milk is of a deeper yellow. Their color is most commonly a shade of orange, with some patches of white. The horns are short and often turn upward and inward, giving them a rather unique and stylish appearance. The general look and outline of the two breeds, and Jerseys and Guernseys are similar, and the color is very much the same, as well as other general characteristics, like the quality of their milk. Both are eminently fitted for the butter dairy. 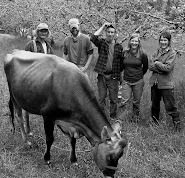 On ordinary keeping many Guernseys have yielded from fourteen to twenty-two pounds of butter a week, enough, certainly, to satisfy the ambition of any reasonable dairyman. The number of pure Guernseys in this country is now about equal to that upon their native land. 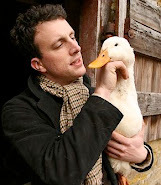 On most farms there can be found located somewhere upon the premises a muck hole which for ages has been filling up with decomposed vegetable matter. Shovel this muck into piles, to remain until dry, then it should be carted into the barn yard to be used as circumstances require. In mixing it with the manure in the yard, select the lowest places to spread it on, so that the drainage from the higher parts of the yard, or urine from the stable may flow upon it. Spread a quantity of it every night as litter for the cattle to lie upon. 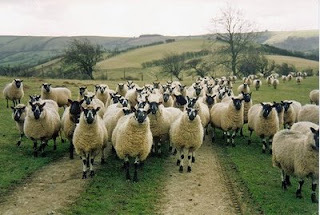 This earth, impregnated with urine, kneaded under the feet of the cattle, will lose nothing which has been given to it. Soap suds, and all the urine, &c., from the chambers, should be mixed with the manure heap composed of earth. The result of observations shows that a man renders per day at least three lbs. of urine and other matters; this, multiplied by 365 days, gives a yearly product of 1100 pounds per person, or 11000 pounds for ten persons who ordinarily live upon a farm. This old almanac entry speaks of something that was common in the Agrarian Nation—the use of "night soil." Night soil is human excrement ("other matters") used for fertilizer. 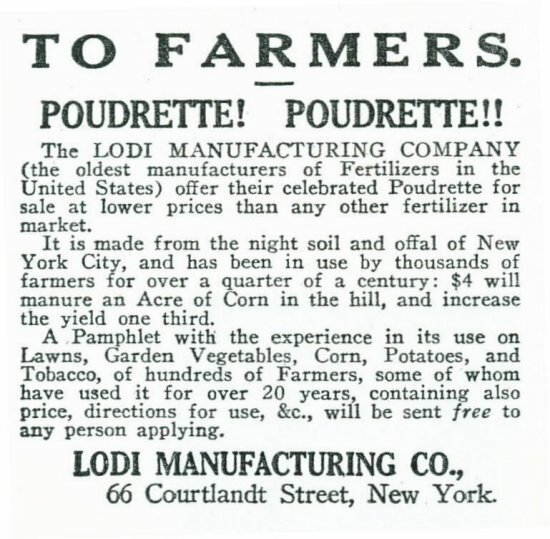 In my extensive collection of "Cultivator & Country Gentleman" magazine from the late 1800's there are ads for "Poudrette." Poudrette is defined as "a manure made from night soil, dried and mixed with gypsum, charcoal, etc." 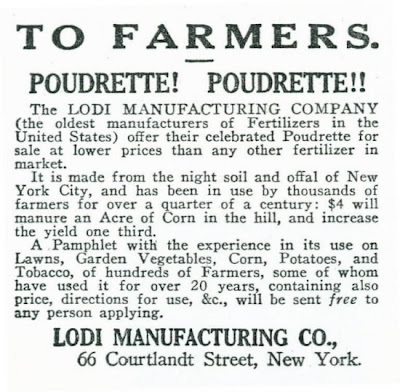 It's interesting to note that "poudrette" is still being sold to farmers. It is municipal sewage sludge and it's now called "biosolids." I have no problems with using properly treated "humanure" as a fertilizer, but sewage sludge has all kinds of potential toxins in it. 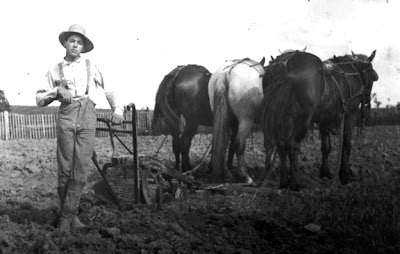 I'll bet the biosolids of today are a whole lot more toxic than the poudrette of the late 1800s. You can learn more about sewage sludge used in agriculture at this link: United Sludge-Free Alliance.